REASONS to love dogs: No. 342c – they can wash your clothes. 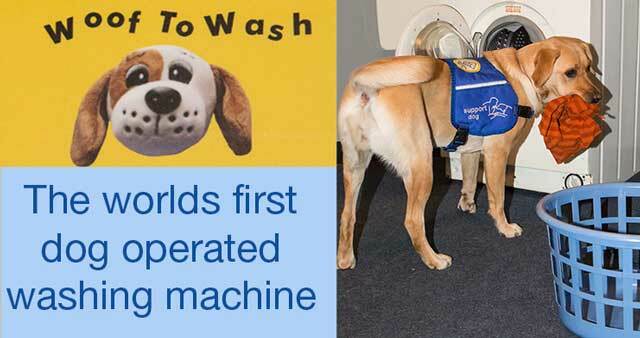 Woof to Wash enables specially-trained dogs to work an adapted washing machine with a footpad. The machine starts with a ‘woof’. Detergent is dispensed automatically. The door is opened by pulling a rope. The device, which places dogs in direct competition with Romanians and Bulgarians (they can often only work in the UK as cleaners), is the work of John Middleton. “People who are visually impaired, have manual dexterity problems, autism or learning difficulties can find the complexity of modern day washing machines too much,” he says. “I had been working on a single programme washing machine to make things easier, and there was a lot of demand for it. Dogs and man in harmony. 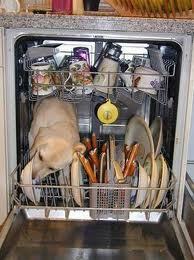 And ever better than that, they also clean the dishes.